Eat Well. Cook with Love. Make your Belly Happy. This clean eating Chunky Black Bean and Corn Salsa is a game day favourite and comes together in about 10 minutes. It’s loaded with fresh ingredients, tons of flavour, and plenty of texture. Grab your favourite tortilla chips and dig in! 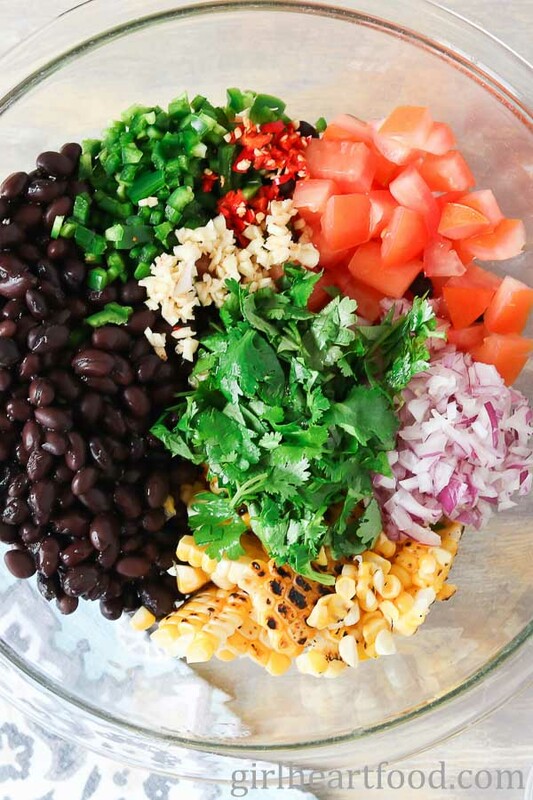 Speaking of bringing a dish to the party – this black bean salsa! Guys, it comes together in minutes and it’s a great balance for all those indulgent game day eats you may be enjoying, like wings and nachos. If you can find ’em, use ‘no salt added’ black beans. If not, that’s a-ok. Whatever you use, rinse and drain the beans well. Some people don’t like cilantro (as a matter of fact, I used to be one of them). Though it definitely won’t add the same flavour, parsley will add that pop of green colour if you’d rather use that. I used both jalapeno and Thai chili in this black bean salsa. I love things spicy, but if you don’t just add less. While not necessary, grill the corn to get a little colour. Wondering how to cut corn off the cob? Check out this helpful guide (I like the two bowl method). Speaking of corn, fresh corn is used here. Don’t have that on hand? 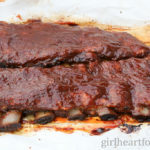 Frozen works great too (though you can’t grill and it won’t have that same pop of freshness, but will work in a pinch). Just thaw and use in recipe. I left the ingredients a little chunky. After all, it is a ‘chunky’ black bean and corn salsa. However, if you like you could cut some ingredients smaller. Want this salsa to be a little less ‘loose’? Stir in about 1/4 cup of your fave store-bought salsa. It’ll help bind the salsa. This black bean dip is so chunky, you could totally enjoy as a salad or side dish. It would also be super yummy on tacos or served with quesadillas. Gotta have options, right 😉 ? Hope you love this black bean and corn salsa as much as I do! Until next time, take care and chit chat again soon. 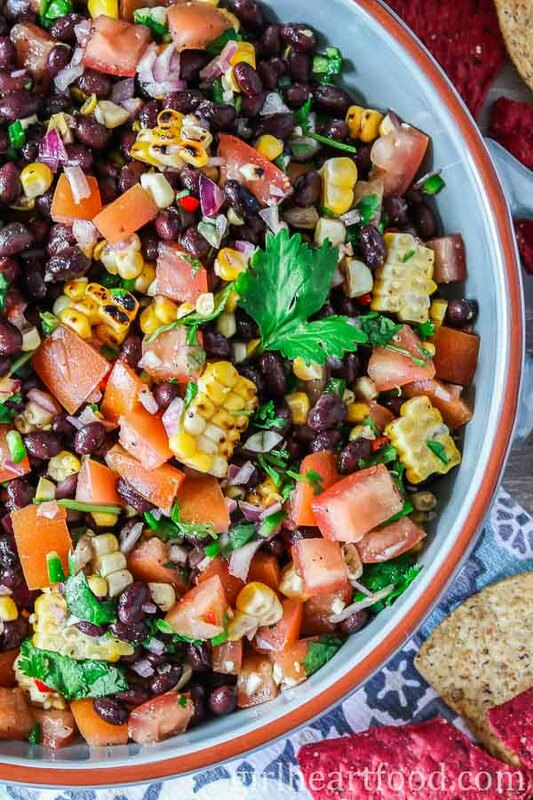 This clean eating Chunky Black Bean and Corn Salsa is a game day favourite and comes together in about 10 minutes. It's loaded with fresh ingredients, tons of flavour, and plenty of texture. Grab your favourite tortilla chips and dig in! Combine all ingredients in a bowl, stirring to combine. Enjoy with your favourite chips! Tried this recipe? That's awesome!Mention @dawn.girlheartfood or tag #girlheartfood! © Girl Heart Food. All images and content are COPYRIGHT PROTECTED. Please do not use any images without prior permission. Please do not republish this recipe. If you want to reference this recipe, link directly back to this post. Thank you. LOVE EASY & DELICIOUS RECIPES? SUBSCRIBE FOR FREE! I like that you charred the corn for extra flavor. Hahaha, Dawn, you are a girl after my own heart! I’m not about any sort of sport – but I will gladly attend any sport related get together because of all the snackage! And speaking of snackage – this chunky black bean and corn salsa is indeed a game changer! Heck, I’d finish a bag of chips dipping into this – thoughif there was any of this left, I’d grab a spoon and keep on snacking! Happy almost weekend, Dawn! Been there 😉 Thanks Shashi! Totally! All about balance, right ;)? Thanks Kevin. Mmmmm…..This is making me hungry right now! I love dishes like this because I can eat a ton and not feel bad! The charred corn looks so yummy and I’ll bet it adds a lot of flavor! I agree 🙂 !! It certainly does! Thanks Kathy. I’m so glad to know another fellow Canadian who doesn’t really watch hockey 😉 LIke you, however, I DO love the snacks that come along with sports-watching! Haha. I bet this salsa would be soooo good with plain, salted tortilla chips! Have a great weekend! I will watch and enjoy baseball (go Jays! ), and I will watch and tolerate Football, but I cannot stand to watch hockey on tv. I hate it. I am a bad Canadian 😉 But I do love this salsa! To heck with sports, I’ll just make the salsa and enjoy! Lol!! Sounds like a plan to me 😉 Thanks Jennifer! This is a complete meal to me:) Even if I ran out of chips I’d be more than content to continue to indulge. Cheers to the weekend around the corner! I think so too 😉 Thanks Milena! I love football, but it’s always more fun to watch when there’s good food involved. Your salsa will have to make an appearance at my Super Bowl party this year! I loooove all things snack-y and dip-y (those are words right?) so I’m all over this :). Have a great weekend, Dawn! This is totally my kind of snackage Dawn! I’m not into football or sports of any kind, but like you, if there is food involved, I’ll be at the party! This salsa is perfect and versatile. I’m already thinking of the many ways I will use it! Pinned! Do you watch curling!? I feel like Canadian tv has curling on all the channels, all the time. 🙂 Hey, you are welcome to come to our house anytime you’d like if you bring this salsa! The fresh corn in there is key, and I know this would be a huge hit in our house. Also, kinda funny that your taste buds changed and you’re on the cilantro train now. It is super tasty! No, I don’t!! Can you believe it? I agree – cilantro is pretty yummy 😉 Thanks David! This salsa is loaded with all my favorite ingredients Dawn! I could snack on this all day long. Perfect healthy option for the Super Bowl this year too! Pinned! Hi Fellow Food Lover, I’m Dawn! Welcome to Girl Heart Food! I’m so happy you stopped by. Around here, you’ll find lots of yummy eats from veggie based to gluten free to classic comfort food fare. You’re bound to find something that’ll make your belly happy! Grab your favourite cuppa & get cozy! Read more about Girl Heart Food here. © 2015 - 2019 Girl Heart Food All images & content are copyright protected.